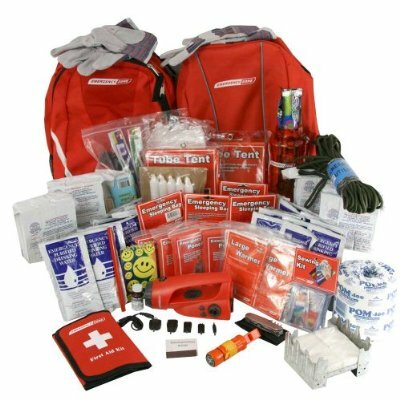 This kit includes the following: 1 Organizational Backpack, 1 Large backpack, 1 Dynamo AM/FM radio and flashlight with lithium ion battery-rechargeable with a hand crank, 4 eight hour light sticks, Magnesium Firestarter, 4 emergency reflective sleeping bags, 4 emergency ponchos, 4 body warmers, 2 tube tents, 20 hour liquid candle, 4 3600 Calorie US Coast Guard approved Food Bars with a 5 year shelf life (SOS brand coconut flavor), 24 US Coast Guard approved Water Pouches (125ml each) with a 5 year shelf life (SOS brand), 1 bottle of 50 Potable Aqua water purification tablets (Aquamira brand), 1 Lexan bottle (1L), 1 multi-tool knife, 1 5-in-1 survival whistle, 1 50 ft. rope, 2 pairs of work gloves, 4 N95 masks (individually wrapped to keep clean), 1 deluxe first aid kit, 1 hygiene kit (4 toothbrushes, toothpaste, comb, washcloth, 10 tissues, 24 wet naps, shampoo), 1 roll of toilet paper, 1 note pad, 1 pencil, 1 sewing kit and 1 Emergency Preparedness Guide. The 48 page HOW TO PREPARE FOR ANY DISASTER gives you the steps to preparedness. It includes emergency checklists, preparedness tips, what to do before, during and after a disaster.